The Giveaway is for one of my Skull Book Lights: What arcane tome is this? 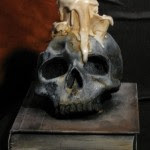 Perfect for a cluttered spell crafter’s desk or witches bookshelf, this ancient tome with a aged skull and battery operated flickering tea light candle is nice for anytime or your Halloween display. Each one is OOAK and may look slightly different than the pictures shown here. Each one is crafted with great attention to detail. Note: Even if you just follow please leave a comment or it makes it very difficult to track who is who and count entries. Without a comment I won’t count the entry. New Incredible Art Doll Swap! The Cartbeforethehorse is doing an amazing 200th blog post giveaway! Yeah!!! I am on a Halloween Treasury on Etsy! Thanks meiguidesigns!!! Another original art illustration by me~this time I built everything on a piece of pine witha simple black background...then layered rice paper, inks, rubber stamps and if you look up close 3D spiders! I have been getting into collages lately...which is also something new for me, but I enjoy adding that extra unexpected texture to my original art work. After having built my own canvas, stretched and primed...I had my daughter mix several colors of paint to creat my background...a sneeky way of getting away with not facing a blank white canvas. The rest was just created layers on layers~ paper, paint, glue, eyelets and yes of course...YARN and a pretty little silk flower! I am quite pleased in the way she came out, but boy was this a new experience for me! It has been a while since I have blogged...between family colds, stomach flus and household chores I have not really had time to create anything let alone blog about it! The hot weather has finally hit Northern VA so running around outside is out of the question, which now gives me time to return to my studio!!! I have two new items for my Etsy shop (Red Riding hood + Boo Puss). Red Riding is entirely hand painted and inspired by one of my original illustrations. Measurements: 9" X 10 1/4". This "Cheater's Quilt technique was inspired by two of my favorite artists Dylan & Jo at The Cart before the Horse. My "Boo Puss" is one of my first created patterns for Halloween. He measures 13" from the tip of his toes to the top of his ears!!! I've also been working on a Marie-Antoinette collage...I'm still trying to figure out what more I want and need to add to it... more is less???? Less...is more??? ?